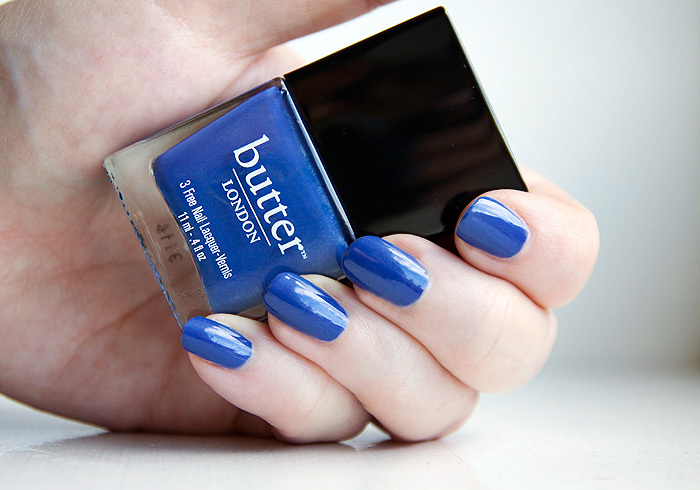 Autumn 2013 saw Butter London release Giddy Kipper, a vibrant blue polish with a hidden shimmer that seemed somehow better-suited to Summer than Fall (as did the rest of the Autumn collection). It reminded me of the blue seas and skies that us UK’ers could only dream of at that time of year. On paper, it should have been beautiful… in other people’s swatches… I’m still mesemerised. But both times I’ve worn it, I’ve been a little disappointed! Now, don’t get me wrong… it’s a beautiful blue. But, BUT… I’m really missing out on the extra dimension from its hidden shimmer. In order to appreciate this beauty in the same way that other (U.S. bloggers) have been able to do, you need a good sprinkling of direct sunshine. There’s nothing wrong with that, a delicate holo will only show its true colours when the sun has got his hat on! But I think I’ll be putting this one away for the Winter and Spring and bringing it back out for an outing once June rolls around, then… and only then will I really be able to appreciate this little number for its hidden surprises! Application was fine, a two-coater… nothing unusual to report with the formula, your standard solid Butter London fare! What’s been your favourite blue this season? I don’t know if anyone else has already mentioned this, but your photos haven’t been showing up in the RSS feed for the last few weeks. I use Feedly and I don’t have this issue with any other site, just Lipglossiping, and only recently. Thanks lady, Tsunimee said the same thing.. so I checked Bloglovin’ which I think uses my RSS and they were there so thought it might be a temp. glitch for her reader. Obviously not! I’ll find out what’s going on and try to get to the bottom of it.